Immerse yourself in the outstanding beauty, culture and architecture as you make your way from the Czech Republic to Austria in 7 days. Explore the top attractions of Prague like the Old Town Hall tower with its legendary Astronomical clock and go on a trip to Bohemian Kutna Hora to see the countryside and key medieval and Baroque monuments. Then enjoy Vienna and its numerous magnificent buildings, including the Schonbrunn Palace, and see the Vienna Woods. Welcome to the fairy-tale capital of the Czech Republic - Prague! Upon arrival, you are met by your private driver at the airport and transferred to your neat Prague hotel for check-in. The rest of the day is at your leisure. Following breakfast, you embark on a 4-hour voyage of discovery into the Old Town with your private guide who shows you the most magnificent city sights. You walk the famous Royal Route, originally used for the king's coronation procession, and see the Municipal House, the Gothic Tyn Cathedral, the Cubist House at the Black Madonna and the Old Town Hall tower with its legendary Astronomical clock. Then you explore Parizska street modeled after a Parisian boulevard, Josefov area - the former Jewish ghetto, the Rudolfinum concert hall and the famous Charles Bridge with the splendid Prague Castle (no entrance included). Fee for public transport to travel between the sites with your guide is included. After the tour, you return to your hotel. You have the evening free to enjoy Prague at leisure. In the morning you enjoy your breakfast, meet your private guide and driver at the hotel lobby and embark on a 6-hour tour to magnificent Kutna Hora. Following a 1.5 hour ride through the beautiful Bohemian countryside, you reach the stunning town of Kutna Hora. This UNESCO World Cultural Heritage Site gained excessive wealth thanks to its prosperous silver mines and became the second most important town in the Kingdom of Bohemia, after Prague. 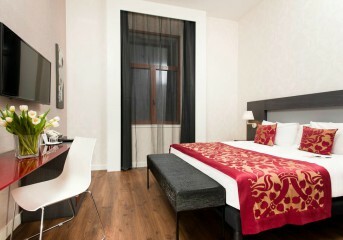 After the tour you return back to Prague and have the rest of the day at your leisure. Today after breakfast you check out from your hotel and meet your private driver in the hotel lobby. Then you are transferred to the railway station to take a train to Vienna. Note: you may extend your stay in Prague and have optional day-tour to Karlovy Vary. Please, contact your travel specialist for the details. Explore the town of Karlovy Vary, a charming spa town, is a popular tourist destination, during your 9-hour guided tour. To reach it you are driven about 2.5 hours to the west from Prague. During the tour, you explore all the must-sees including Park Colonnade, Chateau Gate and Grandhotel Pupp, which appeared in the James Bond movie in 2006. After about 4 hours of the train ride (1st class train tickets are included), you arrive in the European capital of music. Your private driver picks you up at the station and transfers to the hotel in the very heart of the city. The rest of the day is free for you to either relax or start exploring glorious Vienna on your own. Following breakfast at the hotel, your guide takes you on a 3-hour walking tour through the downtown area of Vienna. You start at the State Opera House and walk through the Kärntnerstrasse, a shopping street in the pedestrian zone of the city center, to St. Stephen’s Cathedral. You continue your walk along the Graben and the Kohlmarkt, a very exquisite shopping area, to Imperial Palace Hofburg, the former winter residence of the Habsburgs. It now houses the Imperial Apartments, Sisi Museum, Imperial Silver Chamber, Austrian National Library and much more. The next on your list is Ring avenue with its numerous magnificent buildings, such as the Museums of Fine Art and National History, the Parliament, the City Hall and the Burgtheater, to name a few. During the tour, you also see Neuer Markt and the Capuchin monastery. After the tour, you return to your hotel and have the rest of the day free. In the evening you can enjoy optional concert 'Sounds of Vienna'. ​​Enjoy world famous Vienna classical music in the very place where Johann Strauss himself used to direct his orchestra! In the evening you are invited to a fantastic music concert performed by the Salonorchester Alt Wien, one of the best-known interpreters of classical Viennese music. The event is held in the magnificent Lanner Hall of the Kursalon, built in the 1860s in Renaissance style. This is the final day of your tour. Today your driver takes you to the airport for your flight back home. We hope you enjoyed your European tour and the charming capitals you have explored! Note: you may extend your stay in Vienna and have optional day-tour to Wachau Valley & Wine Tasting. Please, contact your travel specialist for the details.